Looking for a cheap flight from Auckland to Blenheim (AKL-BHE)? Before you book a flight you can use Utiket to find the cheapest flights from Auckland to Blenheim for Air New Zealand. All flight data are real-time and accurate. Utiket finds all the cheapest flights from Auckland to Blenheim. On average the flight time between Auckland and Blenheim is about 1 hr 30 min. There is no time difference between these cities. The timezone for both cities is: UTC +12:00. The local time now: 01:21:37. The Marlborough Airport, also known as Woodbourne Airport and Blenheim Airport is with around 250.000 passengers a year, a medium-sized airport located about 8 km west of the town of Blemheim in the northwest corner of the South Island of New Zealand. The Marlborough Airport was one of the first airports in New Zealand and is still one of the few remaining air force bases (Base Woodbourne). The terminal building was recently renovated and includes a cafe and free wifi. Air New Zealand Link (Air Nelson and Mount Cook) have flights to Auckland and Wellington while Sounds Air flies to Christchurch, Kapiti Coast, Napier and also to Wellington. 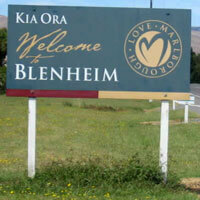 Find cheap flights to Blenheim or read more about Blenheim Marlborough Airport. Need place to stay in Blenheim?